Eight-Day, Weight-Driven Movement with4/4 Westminster Chime and seconds indication. Prescision movement with Graham escapement, complete with wooden pendulum rod, breass weight sheels with fillings, 8-rod gong and second hand with silencing lever. Pendulum length 88 cm, Suitable pend. bobs: diam. 115 mm, Pendulum swing: approx. 22 cm. Eight-Day Weight-Driven with 4/4 Westminster chime and seconds indication. Precision movement with Graham escapement. Design dimensions same as movement PG. Complete with seat Board. wooden pendulum rod, chains, brass weight shells with fillings, 8-rod gong (66 cm long), moon dial mechanism second hand. Without pendulum bob. The moon dial has a satin finish brass face with applied satin-silver hour and seconds ring, dial center with granular finish, and cast corners. Milled clock hands. 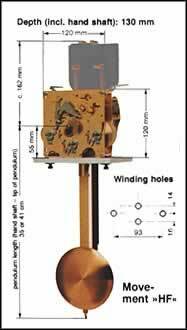 With silencing lever Pendulum length: 108 cm Dial 280 x 375 mm. Suitable pendulum dial diam. 140 to 165 mm. Pendulum swing: approx. 28.5 / 31.5 cm Weights: diam. 60 mm, 3 total, 2 x 3 kgs, 1 x 3.5 kgs. 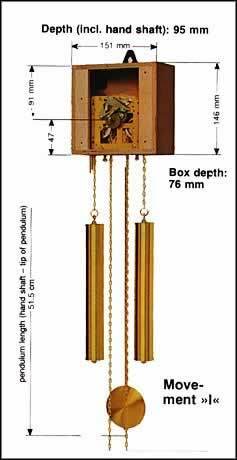 Movement with Bim-Bam Chime on 3 Rod Gong Pendulum length 72 cm. Pendulum bob: 70 mm diam. Pendulum swing: approx. 20 cm. Weight shells and pendulum: satin-finish brass. Chains: brass plated. Movement with Bim-Bam Chime on 3 Rod Gong. Pendulum length 51.5 cm. Pendulum bob. 70 mm diam. Pendulum swing approx. 15 cm. Weight shells and pendulum: satin finish brass. Chains: brass plated. ight-Day Weight Driven Movements. Strike or chime on hour and half hour. These movements are fitted in a mounting box which can easily easily be attached to clock dials and cases. Complete with pendulum weights (2 x 1.2 kgs) and chains Max. dial thickness 12 mm, center hole diam, 8mm. Movement plates: 87 x 87 x 1.3 mm. Eight-Day Weight Driven Movement with 4/4-Westminster chime. Precision movement with Graham escapement and second indication. Complete with seat board, wood pendulum rod, chains, brass weight shells with fillings, 8-rod gong (68 cm long) and second hand. Without pendulum bob and clock hands. 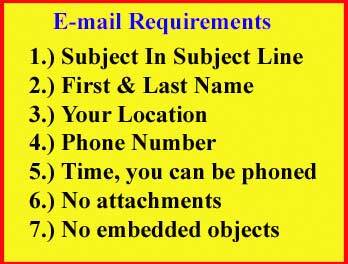 Suitable dials: Pg. 1~19. Weights: diam. 60 mm, 2 x 3 kgs, 1 x 3.5 kgs. Pendulum length 88 cm. Suitable pend. bob diam. 115 mm. Pendulum swing: approx. 22 cm. Eight-day Weight Driven Movement with 4/4-Westminster chime. Precision movement with Graham escapement and seconds indication Compete with seat board, wood pendulum rod. pewter plated weight shells with fillings pewter-plated chains 8-rod gong (68 cm long) and second hand. Without pendulum bob and clock hands.. Weight: diam. 60 mm, 2 x 3 kgs, 1 x 3.5 kgs. Pendulum length 88 cm. Suitable pend. bobs: diam. 115 mm. Pendulum swing: approx. 22 cm. KG Cuckoo Clock Movement, complete with chains, weights, wooden pendulum with leader, hand nut and washer, minute hand bushing. Equipped for strike on round gong on hour and half hour. Without round gong, clock hands, bellows and lifting wires. Pendulum length: approx. 24 cm. 1-Day Movement with two 275 gram weights. KG Cuckoo Clock Movement, complete with chains, weights, wooden pendulum with leader, hand nut and washer, minute hand bushing. Equipped for strike on round gong on hour and half hour. Without round gong, clock hands, bellows and lifting wires. Pendulum length: approx. 24 cm. 8-Day Movement with two 1500 gram weights. 8-Day Regulator Movement. Spring-wound, 4/4-Westminster chime on full and half hour. Complete with 8 rod gong, wooden pendulum rod, mounting hardware and clock key. Without clock dial, hands and pendulum bob. Four hole design from Center Hole distance is 46.5 mm to holes on left and right for a total distance between these 93 mm. Center holes are 30 mm apart, holes on right and left are 14 mm below top hole in center and 16 mm above the botton hole in center. Pendulum length is always measured from center of hand shaft to tip of Pendulum bob. Distance is 35 CM or 350 mm for this clock.